Because cornstarch is made from corn and only contains carbohydrates (no protein), it is a gluten-free product. For this reason, cornstarch is an excellent gluten-free alternative to flour thickeners in recipes. Be sure to check the packaging to make sure your cornstarch has not been produced in a facility that also processes wheat products, to prevent the possibility of cross-contamination. Cornstarch can be mixed into cool or room temperature liquids and then heated to cause a thickening action. Cornstarch is often preferred to flour as a thickener because the resulting gel is transparent, rather than opaque. 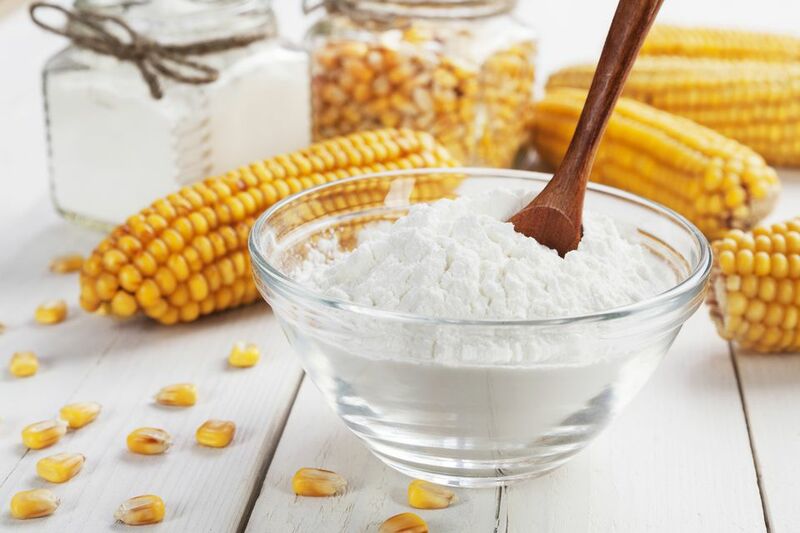 Cornstarch is also relatively flavorless compared to flour and provides roughly two times the thickening power. It can be substituted at half the volume of flour in any recipe that calls for flour as a thickening agent. Cornstarch is also used as an anti-caking agent. Shredded cheese is often coated with a thin dusting of cornstarch to prevent it from clumping in the package. The cornstarch will also help absorb moisture from condensation and prevent a slimy texture from developing. A small amount of cornstarch is often mixed with powdered sugar for the same purpose. Cornstarch is comprised of long chains of starch molecules, which when heated in the presence of moisture, will unravel and swell. This swelling action, or gelatinization, is what causes the thickening to occur. Cornstarch should not be added straight into a hot liquid as this can cause it to clump and form lumps. Cornstarch should first be mixed in at room temperature or slightly cool liquid to form a slurry, and then stirred into the hot liquid. This will allow for even distribution of the cornstarch molecules before they have a chance to swell and gelatinize. Mixtures containing cornstarch should be brought to a full boil before cooling. Under heating, cornstarch mixtures can cause them to seep moisture or become thin again upon cooling. The mixture may appear thickened after slight heating, but if the starch molecules are not fully gelatinized, they will release the moisture once cooled. Sauces and other mixtures thickened with cornstarch should not be frozen. Freezing will break down the gelatinized starch matrix, and the mixture will become thin after thawing. Because cornstarch absorbs moisture, it is critical to keep it in an air-tight container where it will not be exposed to ambient humidity. Cornstarch should also be kept away from extreme heat. Store your cornstarch in a sealed container and a cool, dry place. When stored properly, cornstarch will last indefinitely. What Are the Proposed Benefits of Ingesting Tulsi?